You’ve got post-its blanketing every surface of your office, stacks of paper burying your desk, and let’s not even mention the spreadsheets … when it comes to managing projects for your company, everything is organized chaos. But it’s like this in every service-based business - so why do you need to change? 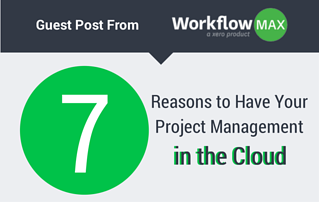 By moving your project management system on to the cloud, you can eliminate the clutter. All of those different tasks taking up room in your office can be streamlined into one program. Information can be transferred from one stage of the project to the next with the click of a button. And if disaster strikes and you can’t access your computer or your office, you can pull up all your data on another device and get working again. If your business is anything like mine used to be, you have information stored in a hundred different places: emails in your inbox, job details in an online system, invoices in a folder on my desktop. Nothing talked to anything else, so I was constantly re-entering the same information. With cloud-based systems like WorkflowMax, each part of your process is connected to the others, so the data passes seamlessly from end to end. With a click of a button, your quote becomes a job, with the separate tasks ready for time to be tracked against them. When you’re done, click another button, and you’re ready to hit send. Do you, like other marketers, anxiously wait for your finance report at the end of the year to figure out if your efforts contributed to the bottom line? Do you long to understand where your budget is going or which team members are pulling their weight? With many cloud companies offering APIs, you can easily integrate cloud systems together. For example, combine WorkflowMax project management with Salesforce CRM, Box for document storage and Zendesk for support tickets, and you have one powerful system that meets your specific needs. No more swapping between different software systems - everything fits together in one neat little package. Getting paid shouldn’t be a headache, but in business, it’s often the hardest part of the job. With nothing reminding you to chase up unpaid invoices, it might be months before you see money owed from a job, and this is bad for cashflow and your bottom line. Part of any efficient cloud-based job management system will be the invoicing functionality, Invoices are sent electronically, and you can set your software to notify you of any outstanding invoices. How often are you shuffling through piles of paperwork to find the info your client needs? What do you do when a client rings asking to double-check their information? Is your idea of “collaboration” calling everybody in for endless meetings to decide on little details? With a cloud-based system, you can present a professional organised tool to clients - another way to add value to your services and set your company apart. Want to meditate at a Tibetan monastery? Want to get your invoicing done from a Parisian cafe or hike the Amazon jungle during your firm’s busy season? Previously, you might be relying on internet cafes and constant phone calls back to the office to stay on top of things. Many “old-school” businesspeople don’t trust the internet. They prefer to have everything in hard copy. That way, when the computer crashes (as computers inevitably do), the data is still stored somewhere. However, what if a disaster happens and you can’t access your premises for several days? What if something wipes out all your files? Storing information in hard copy files or on a single server can be disastrous in the event of a disaster. Steff is a former Inbound and Content Marketing Specialist at WorkflowMax, a cloud-based job management system for creative agencies and services businesses.